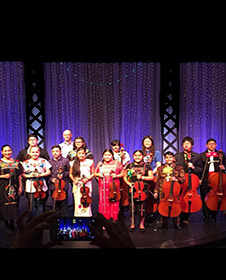 The World Youth Orchestra (WYO) is the primary program of Young Strings Project Outreach (YSPO), whose mission is to enhance the lives of youth with limited means and limited access to classical music experiences and education in the Seattle area. The goals of the youth orchestra program are: 1) to provide instruction, without charge, to youth who wish to play a classical instrument and participate in a music ensemble and would not otherwise have the opportunity to do so; 2) to offer engaging opportunities for under-served inner-city and rural youth.to experience and learn about classical music. Since 2006 YSPO has received grant funds to provide 1200 hours of classical instrument instruction, without charge, to youth who would not otherwise have had the opportunity to play a classical instrument or perform in an ensemble. Students who have music experiences like the ones we provide will see the world and their place in it quite differently. Only a few will become serious musicians, but many will become serious, committed members of their families, communities and professions as a result. YSPO understands that youth with social and economic challenges need strong role models and caring, committed individuals as their teachers. Committed to social justice and inclusion in music education, our teaching artists are accomplished professional musicians with years of experience teaching disadvantaged and under-served youth, in English and Spanish, to play classical instruments and perform in ensembles. The World Youth Orchestra program develops skills required as members of an ensemble, not just as individuals. The majority of students' time is spent practicing as an ensemble. Learning to play a classical instrument and participating in an ensemble has the power to change the trajectory of young lives. For its first seven years, YSPO provided individual and group violin/viola instruction, without charge, during the school day and after school, to Seattle area children with financial need. Each year our programs provide as many as 200 hours of free instruction by experienced and professional teaching artists as well as instrument rental for students in need. In October 2014 YSPO launched an after-school World Youth Orchestra program at Seattle World School for grades 6-12, thanks to a Youth Arts grant from the City of Seattle’s Office of Arts & Culture. The Seattle World School is the entry point for immigrant and refugee youth in Seattle Public Schools. From 2015-2-18 WYO has expanded its program from two-hour sessions to three-hour sessions, without charge, especially inviting immigrant and refugee youth in the Seattle area. The Saturday youth orchestra sessions have created an opportunity to offer classical music education to more under-served youth in the Seattle area than ever before. World Youth Orchestra instruction includes basic music skills aligned with the Washington State Academic Essential Learning standards as well as life skills and experiences that help its young participants learn to see the world and their place in it quite differently, as they gain the capacity for self-realization and fulfillment.